Tanishq comes up with the most memorable promotional films every time the jewellery brand wants to exhibit its new collection. But, what is noteworthy is that each time, the brand’s films have carried a startling social message with élan. Banking on the wedding season in the country, the jewellery brand has just released its latest wedding film featuring a sweet little grandma, with a big social message for us. The minute long film is set at a Tanishq showroom with the entire family of the bride seated and waiting anxiously to look at Punjabi wedding jewellery. The scene is a typical one where the bride is excited about trying out the various jewellery sets being shown to her, while her worried mother and busy father look on. There is also a younger sister sitting beside the grandma. While all family members are concentrating on the jewellery being shown to them, the mischievous looking dadi is engaged elsewhere. She is shown being tempted by all the jewellery worn by a South Indian bride on the other side of the showroom. As soon as the bride is all decked up in the Punjabi style jewellery, she asks dadi for her suggestion. The dadi approves her look but tells her not to wed a Punjabi boy. “How boring”, she says and tries to convince her granddaughter to marry a South Indian so that she could get to wear two kinds of jewellery – Punjabi as well as South Indian. The cleverly done film has got its storytelling right. The stunned question mark on everybody’s face when the grandma forbids her granddaughter to marry her Punjabi boyfriend reflects that of the viewer. Right when we are shocked as to why is the grandma objecting to a wedding within the same community, she flings a brilliant social message right back at us. We expect the older generation in India to be totally against outer caste marriages, but here is a dadi that is encouraging her granddaughters to fall in love outside their caste. Though the premise is to feature the Tanishq range of jewellery for all types of weddings, the social message weaved in is what glitters the most. 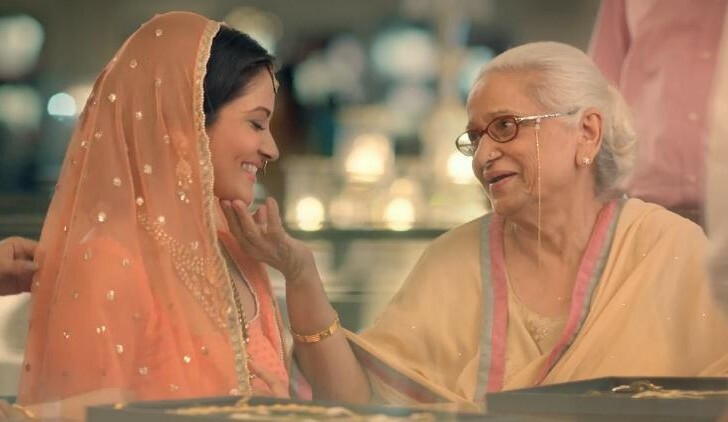 The Tanishq 2014 wedding film featuring this adorable dadi is a complete winner in terms of product showcase and brand message. Last year, the jewellery brand had created a massive stir on social media when it went against society stereotypes by featuring the second marriage of a dusky bride who is the mother of a little girl. While it raked in intense praise for its bold theme and triggered a whole lot of conversations around second marriage and our obsession with fair complexion, it also won a place in Adweek’s list of ‘The 7 most inspiring ad campaigns for women in 2013’. The Tanishq 2014 wedding film is also walking the same path – triggering conversations around India’s obsession with inter-caste marriages. A brilliant and strategic move for an advertising piece in this social media driven age.